What do u think my new fav food/ drink is? I finally got a mouth! -Mephiles. 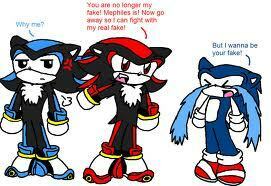 de keuze van de fan: MEPHILES HAS A MOUTH!!? What picture do u like best? de keuze van de fan: Pastel. Do u like the couple, Mephadow (Mephiles X Shadow)? what do u think of mephiles? who do u think mephiles should be with amy of nobody?dont yell at me if u dont like mephamy! 3. Tell Blaze that he killed Silver. He will be geroosterd brood, toast within the volgende five minutes. Ocean is a young Mobian Hedgehog who is zei to have a legendary bloodline. His parents were Anna and Cody the Hedgehogs, Anna being Shadow's daughter and Cody being Sonic's son. This makes Ocean the first pure crossover from both Shadow and Sonic's bloodlines, resulting in his incredible powers. My hart-, hart was thumping hard in my chest, my breath all I could hear in the darkness. The fear of the hunted lay down upon my shoulders, adrenaline the only thing keeping me from falling to my knees. RaeLogan, auteur of the hit series featuring Mephiles. an article was toegevoegd: Mephiles the dark: chapter 1: The dag my secret and one of Sonic's rival's secret is revealed..
a comment was made to the poll: What do u think my new fav food/ drink is? I finally got a mouth! -Mephiles. did sometimes mephiles kissed shadow?and where?